It’s been years since you have been able to easily wield a crochet hook or a screwdriver. Remember when your grandkids would come to visit? You used to jump out of your chair and meet them at the door. Now you grunt and groan as you hoist yourself up. All this loss of movement and change of life is because of rheumatoid arthritis. Do you ever wonder if there is anything you can do to get your pep back in your step? What you eat matters for your rheumatoid arthritis. Your body needs the right nutrients in order to keep at an optimum level of health. Some foods aggravate rheumatoid arthritis symptoms and should be avoided. Other foods help relieve rheumatoid arthritis symptoms and should be included in your diet. Fried Chicken. Fried chicken is a problem food for several reasons. Poultry skin has a high saturated fat content. In addition, fried chicken is submerged in a vat of oil, lard, or shortening. Fried chicken, dripping with fat, along with other high fat foods are linked to heart disease and known to contribute to inflammation. White bread. The refined white flour used in white bread has had the healthiest parts of the wheat removed. Anything baked with white flour (cookies, cake, crackers, etc) causes inflammation in the body. Potato chips. Not only are potato chips high in fat, but they also contain a high level of sodium. 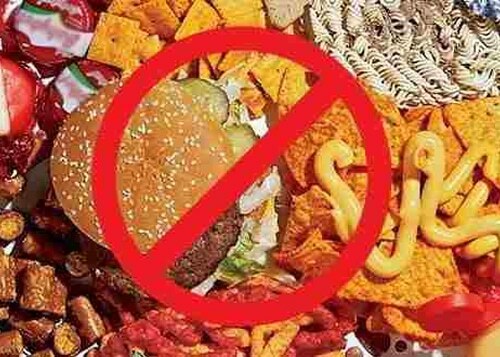 Potato chips and other salty foods like instant noodles and popcorn should be avoided because salt causes inflammation in the body. Donuts. In addition to having high fat content and white flour, donuts are also high in sugar. Consuming high levels of sugar can cause advanced glycation end product or AGEs. AGEs work to destroy certain proteins in the body which results in increased inflammation. Salmon. Fish are high in Omega-3 fatty acids which lowers inflammation giving relief to your joints. Salmon has the highest level of omega-3s with 2 grams in every 3-ounce serving. Bonus: salmon is readily available and easy to prepare baked, broiled, or grilled. Brown Rice. When you have a rheumatoid arthritis flare up, the levels of CRP may be increasing in your body. CRPs are C-reactive proteins. Eating whole grains like brown rice, quinoa, barley, triticale can lower the levels of CRP in your body. There are even delicious whole grain blends available in your grocery store. Look for them in the aisle where you would find rice. Olive oil. 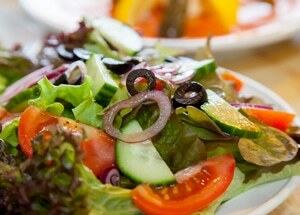 Drizzle some high quality extra-virgin olive oil over your salad. Olive oil contains a natural chemical which can stops the body’s production of the chemicals that cause inflammation. Taste the rainbow. But not the Skittles version! 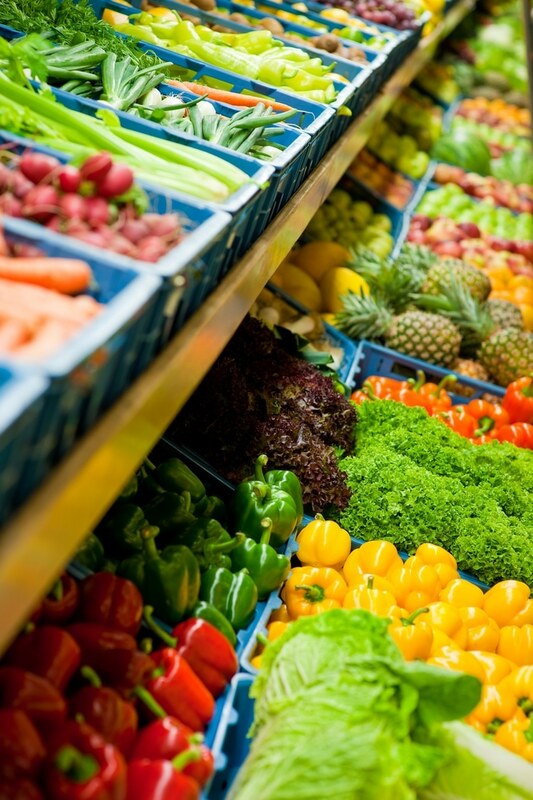 Fruits and vegetables come in a wide variety of colors and hues. Each color means there is a different combination of antioxidants contained within the food. Eating a rainbow of foods means that your body is getting all the antioxidants it needs to keep healthy. Garlic. Garlic has anti-inflammatory properties. Include garlic when you sauté or roast your vegetables and fish for a more mellow taste. Deciding what to eat and what not to eat isn’t the only way to live well with rheumatoid arthritis. Just like those who are trying to lose weight need to be intentional about diet and exercise in order to see the most results, those with rheumatoid arthritis will need to choose the right diet and the right supplement. Choosing one won’t be as effective as both combined. While maintaining the right diet will involve many small decisions each and every day, choosing the right supplement is a decision you only need to make once. Once you try Flexcin, you will see for yourself why so many people with rheumatoid arthritis have chosen Flexcin as their daily supplement. 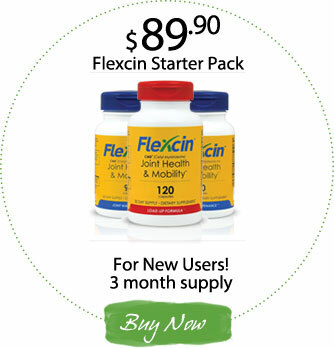 Flexcin is a natural joint pain remedy that is used by many of our customers with arthritis. It is also the only product on the market with Cetyl Myristoleate (CM8), which is a naturally occurring compound that helps to reduce swelling and lubricates the joints. 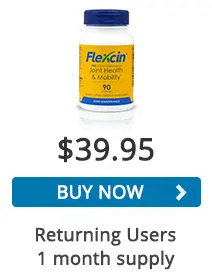 Why do our customers love Flexcin so much? It rebuilds. Pain medications merely mask the pain that comes from your joints. 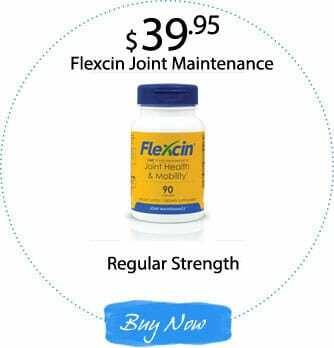 Flexcin actually rebuilds the damaged tissue in the joints and gets to the root of the problem. It lubricates. 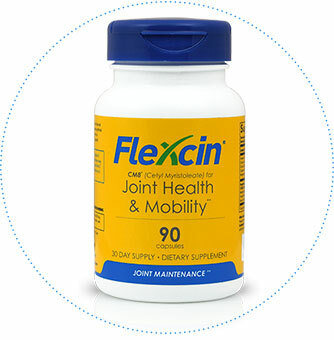 Flexcin lubricates the joints so that you can move freely. It also protects the joints from further wear and tear. It’s anti-inflammatory. The pain in arthritic joins is caused by inflammation. 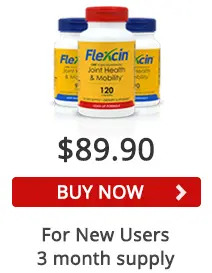 Flexcin reduces the inflammation which reduces your pain. It’s natural. Not only are the ingredients in Flexcin all natural, but the we’ve gone the extra mile to be sure that the ingredients are GMO free. With the right diet and the right supplement, you can find relief from the pain and inflammation from rheumatoid arthritis. Curious about Flexcin? Don’t forget, we have an “it works or it’s free” guarantee, so there is no risk to you. You can simply return the empty bottles if you feel that the product did not help, and receive a full refund of the purchase price. Joint Maintenance Formula: Keep those joints lubricated and working properly long term with the Joint Maintenance Formula, supporting stronger cartilage and reducing inflammation. 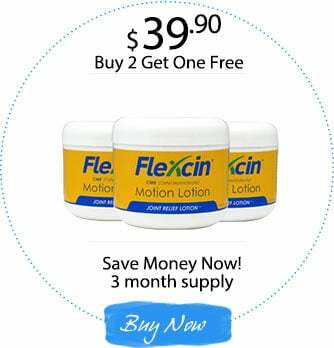 Starter Pack: Get on the right track with Flexcin’s Load-Up Formula and Starter Pack, delivering you a multi-pronged approach to eliminating joint pain and easing bursitis both in the short term and over the long haul. Motion Lotion: When that inflammation comes on, the pain can be searing. 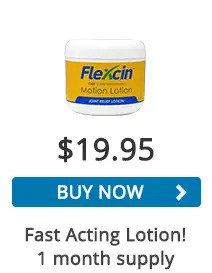 Fast-acting Motion Lotion can provide quick relief for symptoms of sports injuries, repetitive movement, and even some types of nerve inflammation.